Huge Savings Item! 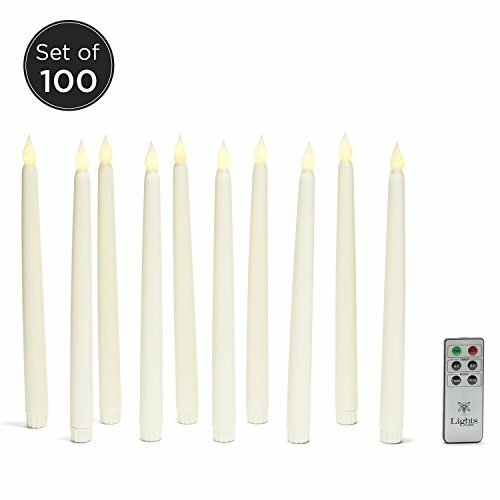 Save 20% on the Set of 100 Smooth Ivory 10'' Realistic Flameless Wax Vigil Taper Candles with Warm White Bright LEDs, Batteries Included- BULK VALUE SET! by LampLust at Animal Backgrounds. MPN: LC003800. Hurry! Limited time offer. Offer valid only while supplies last. These slender, ivory, flameless wax taper candles add warmth and sophistication to any occasion without the worry of messy drippings or open flame. These slender, ivory, flameless wax taper candles add warmth and sophistication to any occasion without the worry of messy drippings or open flame. Let them seamlessly create ambiance for your special event or church service. Description - 10 sets of ten 10" wax taper candles (100 total tapers) with a glowing warm white LED inside each candle. Dimensions - 0.78"D x 10"H (1.905 x 25.4 cm). || LED Color temperature: 2700 Kelvin (Warm White). Batteries Included - Requires 2 AA batteries (ALL Batteries included). | These ivory vigil taper candles are both durable and hazard free. Safe for children and animals. Warranty - LampLust is looking out for your satisfaction. If you have any questions, issues, or concerns please contact us and we would be more than happy to assist. These 10" Vigil Tapers have a 90-day warranty.